Prefab homes have come a long way since the boring and lifeless versions of the past. 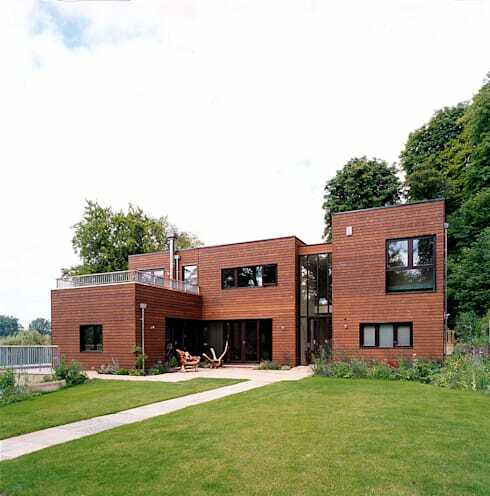 From modern, small prefabricated mobile homes, to larger versions such as this stunning family home in Buckinghamshire, no longer does living in a prefabricated house mean living without modern luxuries, instead, it means you can live in a home that is spacious, modern, and beautiful. 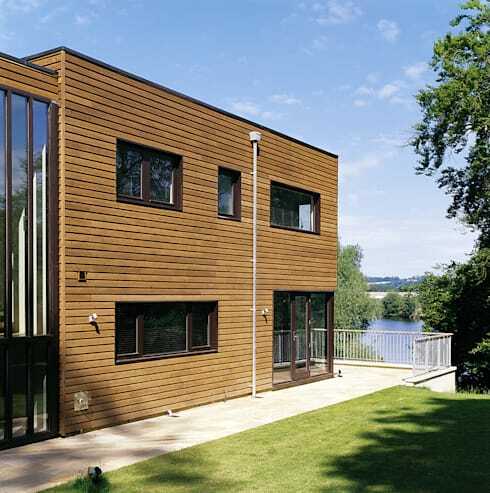 In the small town of Marlow, on the banks of The Thames, is where you will find this stunning example of modern prefabricated architecture. The enviable riverside location and resulting water views led the new owners of the site to enlist TLA Studio to design and create this wonderful timber-framed house, which replaced the existing house that has now been demolished. What ensued was a Bauhaus-inspired home, designed around the existing garage/workshop, making best use of the available river views and stunning landscape of the surrounds. When you think of a prefabricated home, what springs to mind? Is it something that is dull, simple, and highly undesirable? Well, modern building practices have allowed this once typical perception to shift, thanks to modern creations such as this. At a glance, it would be almost impossible to pick this house as being built off-site. The timber cladding that wraps the house helps to draw a strong relationship to its natural surrounds, despite its bold form. The strong, clean lines of the exterior are inspired by Bauhaus design, which was influenced by functionality, simplicity, and a focus on linear shapes and shadows. As you approach the front door, the home appears to almost be two separate structures, thanks to the double-height glass window of the entrance. The natural slope of the site allows for all levels of the home to be afforded the lovely views of The Thames below, as evidenced here. There is not only this terrace which sits above the existing garage and workshop, but the upper level also has a sizeable terrace, as seen in the above image. The generous size of the multi-level home is evident not only from the outside, but also from inside, too. A simple open plan design dressed in white is the most effective way to allow any space to feel larger, and in a grand home such as this, the roomy feeling is only accentuated by these effective design elements. The rocks on this table are actually an ultra-modern fireplace; something that certainly did not feature in dreary prefab homes of the past! The subtle division of the home thanks to the two-storey glass panels of the main entrance can now be seen from inside, here in this image. 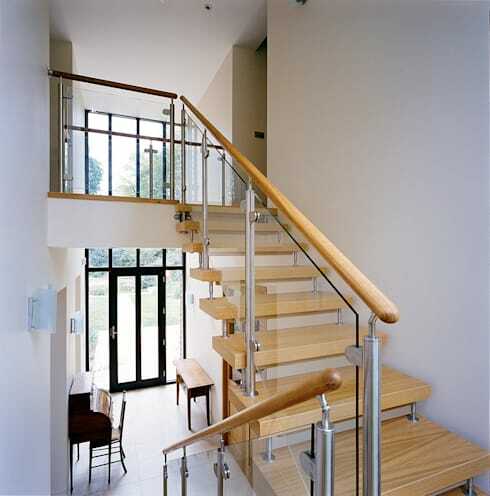 The sheer amount of available light is clearly evident, and is helped along by the light weight feeling on the staircase, achieved with the help of glass balustrades and thin stairs. 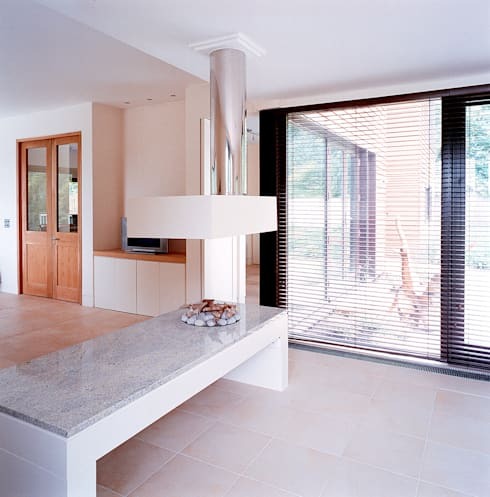 Mimicking the horizontal nature of the exterior timber cladding, modern Venetian blinds don the inside of a number of windows in the house. Along with prefabrication, these are another design element that may have once been attributed to cheap or tacky homes, but they are making a comeback in a big way. 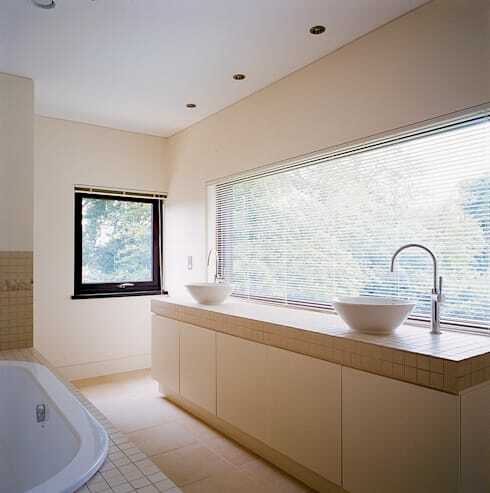 The soft light that enters the bathroom through the blinds glows on a palette of creams and white, which accentuates the simplicity of a minimal and functional bathroom. Felt inspired by this project? If you loved this home that showcases modern prefabrication at its finest, then you are sure to love this stunning prefab home by the sea. From the photos could you have guessed this home was built off site? Were you surprised? Let us know your thoughts on the project in the comments.